BUILD WEALTH & Spend It All! Dr. Riggs has been building wealth for over 50 years through several very different and very successful careers, each of which made him a multimillionaire. 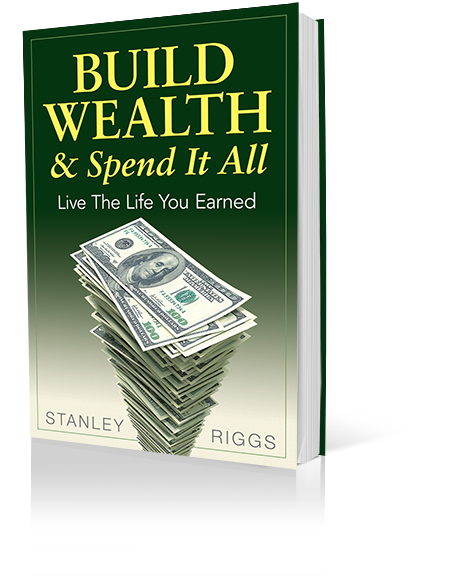 In this book he explains the three basic and easy-to-understand financial concepts anyone can use to both build and protect their wealth. But it was only during this past year, while he was visiting his 96–year-old mother in a nursing home, that he gained insight into what awaits most of our retirement savings. The money his mother had earned as a public school teacher and had frugally saved for over 50 years was rapidly being drained away as she dozed off in her chair. They were taking it simply because she still had it—while other residents who had already enjoyed spending their money, were now getting a free ride. He had helped his mother to save and invest when he should have encouraged her to spend. He had failed his own mother by not encouraging her to spend all she had earned and saved, while she was still able to enjoy it. But he was determined not to fail himself. He needed a plan…a logical plan to enjoy strategically spending or gifting it all away over a predetermined period of time, before the private IRA, 401(k) and Roth retirement accounts are nationalized and redistributed. He needed a plan to spend it all and die broke—insolvent, but not illiquid or destitute. Surprising, his plan for building wealth was simpler and came more naturally to him than his plan for spending it all. Your grave stone will have two dates separated by a hyphen. You have no control over the dates but you do have control over the hyphen … that’s your life. Let this book show you how to make that one hell of a hyphen! Click the orange button to listen to a sample of the audiobook version.